When it comes to arcade games, pinball rates number one in my gaming world. It’s been at least ten years since I’ve touched a table but I recall the thrill of watching that little metal ball bouncing around while keeping a steady eye on my climbing score like it was yesterday. As a child we didn’t have the spare cash or the room for a pinball machine (not that my mother would ever have agreed to such an absurd request) but now I can live the dream with Space Pinball from I’m Toys. This Space Pinball game is made in Thailand from sustainable rubberwood and finished using child-friendly, non-toxic paints and varnish. The space theme will lure kids as they take turns to launch the ball through the galaxy and manoeuvre through various obstacles of ball bouncers, spinning wheels and the tricky planet catchers for those much sought-after bonus points! This charming wooden version of a traditional noisy favourite is sized to fit beautifully upon any tabletop and can be stored easily when not in use. 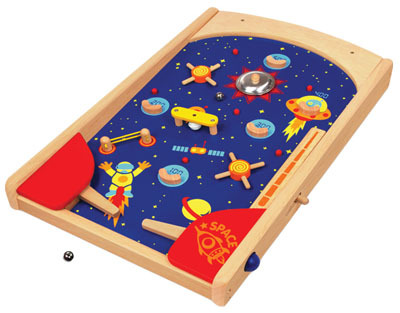 Space Pinball comes with two metal balls and is available for $89.95 from Flying Penguin. Delivery to your door is available so you can get gaming straight away!